These materials models have wide applications such as sheet metal forming , metal forging, crash analysis etc. Apart from these applications, there are also applications where some plastic deformation is allowed in the design. In such cases, first an analysis using linear elastic material is performed and then if the stresses are more than the yield strength, then the analysis is done with the plastic material model. 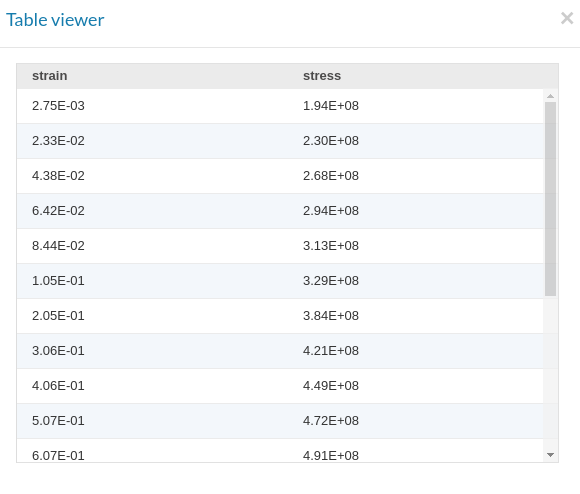 Using your material stress-strain data, make a .csv file. 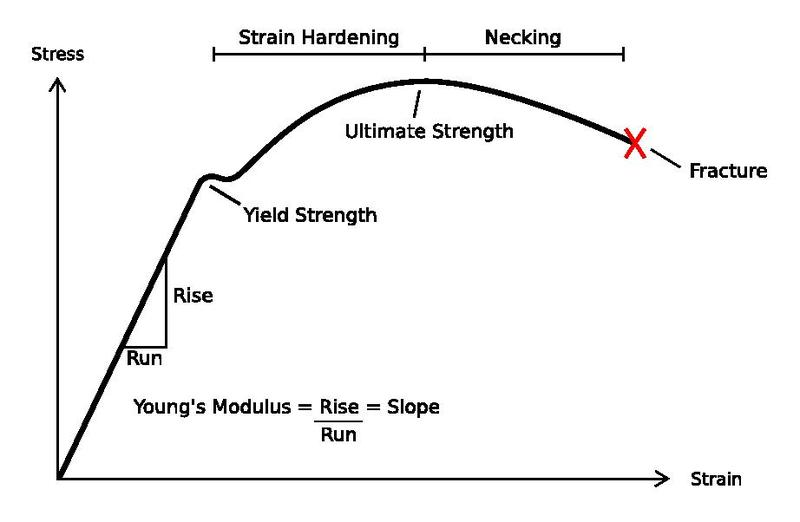 The graph below shows an example of an elastoplastic Aluminum stress-strain data curve. 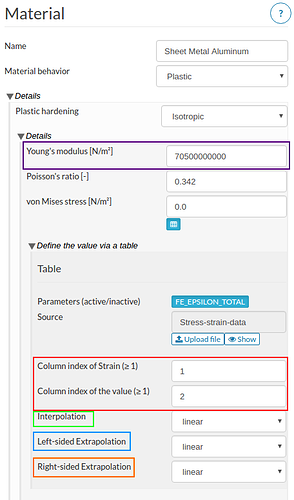 Upload the table to a nonlinear static or dynamic analysis by creating a new material, switching Material behavior to Plastic, clicking table upload button ( ) under under von Mises stress and then click upload file( ). A Upload CSV file window will pop up as shown in the figure below. Click Choose file and select your material file. Give it a name (optional). Next click Upload file. Click( ) button to see the uploaded data whose column should look well separated as shown in the figure below (if both column values are not separated then it means that the selected Separator (delimiter) wasn’t right at the time of upload e.g. using Semicolon as separator for file having column separated with Comma). Once the file is uploaded, you will return to material panel with the uploaded file as shown in the figure below. 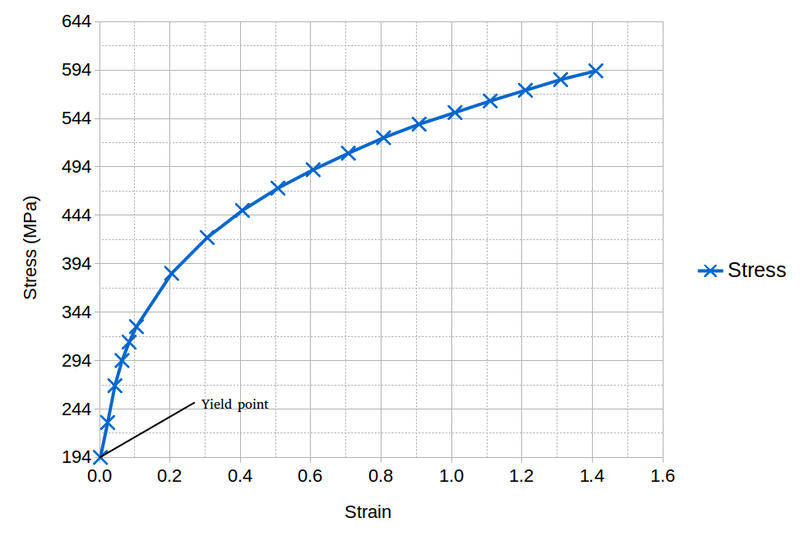 Highlighted in purple is the Young’s modulus value which needs to be calculated by dividing the yield point stress value from strain value e.g. (1.94 e8)/(2.75 e-3) = 70.5 e9. The wrong calculated value may lead to diverged solution. Highlighted in red are the columns for strain and stress values respectively. This is set to 1 and 2 respectively since our file contain strain and stress values in first and second column respectively. Highlighted in green is the Interpolation criteria which is set to linear means the data will be interpolated linearly. One can also choose logarithmic if required. Highlighted in blue is the Left-sided Extrapolation criteria which is set to linear. In current case it would mean that any value of stress for strain values below 2.75e-3 linearly interpolated to the first value of 19.4 MPa. Highlighted in orange is the Right-sided Extrapolation criteria which is also set to linear. In current case it would mean that any value of stress for strain values above 1.41 will be increased linearly based on last two values. Furthermore, you may also have to provide the poisson’s ratio and density for your material. This model is not a suitable choice for brittle material such as ceramics, concrete. It is only applicable for ductile material such as aluminum, steel.